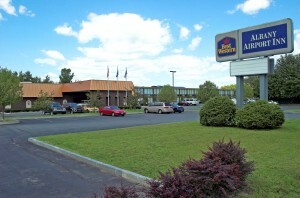 Albacon 2016 will be held at the Best Western Albany Airport Inn on Wolf Rd. in Albany, NY. This location is very convenient to both I-87 Exit 4 and the Albany International Airport. They are also one of the few hotels on Wolf Rd. with a traffic light to make getting out of the parking lot much easier. Please note that due to how the Best Western online reservation system works, you must call the hotel directly to reserve a room in the Albacon block at the Albacon rate. See the section below on How to Reserve a Room for details. Our reservation block has closed. You can still call the hotel and ask for a reservation in the Albacon Block, if there are rooms available you will get the group rate. The hotel is two stories and does not have an elevator! If you have trouble with stairs, make sure you request a room on the first floor when you make your reservation! 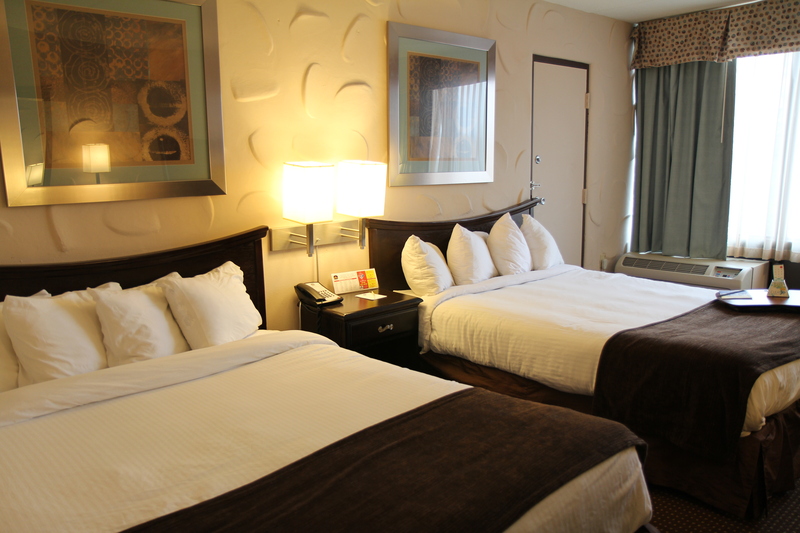 If you need a handicap accessible room, please contact the Albacon Hotel team to insure that you get the room type you need using the Hotel Special Request Form located at the bottom of this page. The rate for guest rooms is $95/night (plus tax) for either a Double Queen or a Single King room (there are no suites). That rate includes complimentary WiFi Internet and a full hot American breakfast buffet from 5:30AM to 10:00AM daily. There is a complimentary shuttle that runs from 4:15AM to midnight which serves the Albany International Airport, any Wolf Rd. location, and for Albacon members, the Amtrak train station. Every room has a refrigerator and microwave and the hotel has an indoor pool and fitness center (sorry, no hot tub / spa). Late checkout (until 4:00PM) is available for Albacon members at no charge upon request (pending hotel availability). You can visit the hotel’s website here. In order to reserve a room in the Albacon block at our negotiated rate you need to call the hotel directly. Call (518) 458-1000 and tell them you are booking a room for Albacon. If you need a first floor room, make sure to tell them, but they will tell you they cannot guarantee that placement. Do not worry. Fill out the Hotel Special Request Form below and we will work with the hotel to insure that you get the room placement you need. We had no problems insuring that people who requested first floor rooms got them last year. Do NOT fill out the Special Request form in order to make a reservation. You need to do that directly with the hotel before submitting any Special Requests. If you are planning on holding a party at Albacon 2016, you must register your party in advance with our party coordinator. All of the party rooms will be located in the same area of the hotel to maximize the fun of the parties as well as minimize possible disturbance to other hotel guests. Parties that are not registered with our party coordinator will be shut down. Please take a look at the Parties Page for more information on hosting parties and to register your party. This is a no cash hotel, which means that they do not have a cash drawer at the front desk, which means you cannot pay your bill by cash. They do accept travelers cheques. If you are paying with a travelers cheque, then upon check-in you will need to provide a $200 cash deposit to cover incidentals and any damage. Unfortunately, since the hotel does not maintain a cash drawer at the front desk, that cash will be deposited into a “drop safe” which can only be opened by the hotel Accounting department. If you are staying until Monday, a return of your cash is possible, but if you are checking out on Sunday (as most people are), there will be no one from Accounting to handle the return of the deposit. You can either stop by the hotel on Monday (if you are local) or the hotel will mail you a check for the return of your deposit. HOTEL SPECIAL REQUEST FORM, such as a ground floor room, or an accessible room, or blocking in a quiet part of the hotel. Use only after a reservation has been made with the hotel.